Festivals are meant to celebrate. Festivities are born to celebrate harvests. Amid, and despite, every hardship, the mankind roaming on this earth would finally reap the harvest. That usually happens once a year. The New Year depends on the usual routine of its followers. Sri Lanka’s evolution of the New Year offers a good example. Upon its first arrival, the Avurudu captivated our ancestors by its good looks, ceremony and charm with the right degree of pomp. But when that allure began to fade away over years, decades and centuries, and returns with unwelcome waves of commercialism and the like, our forefathers must have felt that the memories of their adolescence are gone forever. 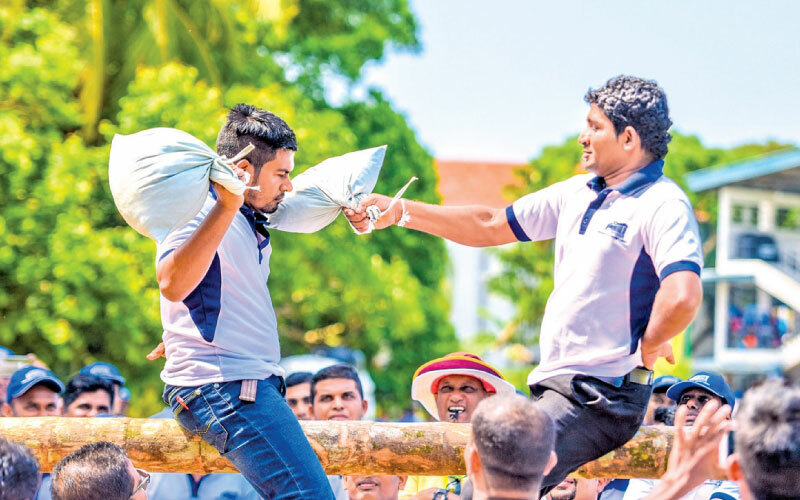 Among all festive seasons of Sri Lanka, the Avurudu must be the one that is least capable of flying under the radar. Awash goes the country’s media apparatus with experts offering descriptions, mostly unoriginal, about the history and other aspects of the ceremony. Another school takes a different path to question and pass judgement on the ceremony for its increasing commercial façade. That school is a minority, constituted mostly by the youths. Questioning is admirable and sometimes looks quite an exceptional option. Then again, can questioning alone do justice? Questioning the validity of Sinhala Tamil New Year, in a way, shows ignorance of the bigger picture. When we question, we indirectly think we are unconventional thinkers. This indirectly makes us happy. Before questioning, we must reflect the bigger picture. Probably why the rest of us opt to tag along with the festive spirit: the Sinhala and Tamil New Year. Like in any other community, the Sinhala Tamil New Year exists to unite people of different backgrounds and ideologies. A festival of such a type is essential for humankind’s survival. Naturally, a man is pushed towards negative traits such as wrath and hatred. These traits continue to pervade most human relationships throughout the year. The festival has the potential to outweigh these negative traits by freshening and smoothening relationships. The soaps on the small screen have often shown how wrathful families finally make amends. The trend or customs may sound boring, as it rolls on every year without much difference. But the human race needs such festivities for the sake of its own survival. A day or two of friendship is much more worth than a whole year spent in wrath. Sri Lanka was preliminarily – and continues to be, albeit to a lesser extent – an agricultural country. So the New Year customs were mostly based on agrarian society. But with the arrival of the British, the society experienced many upheavals. The New Year in the same vein faced a cultural change. Like anything, it too has to face evolution. What is the better New Year? Can we judge? Or, do we have the right to do so? The New Year serves its purpose as the society wheels on with times. Many argue that the New Year has become a trader’s festival – commercialised, more sophisticated in phrasing. Not only such phenomenon is inevitable, but it is also a part of the deal that is evolution. The society’s needs have grown far beyond more than it was a few decades ago. There are certain points where it exceeds beyond the tolerable level. The government had to increase taxes on cars, especially the best-selling Indian brands, as the traffic congestion was getting worse. When buying rate goes high, even beyond a tolerable point, it takes a toll on the whole social system. The rulers have to hold against such currents. Evolution is what everything has to undergo. Festivals and ceremonies are no exception to the phenomenon. In times of yore, the custom was to drop a one-cent coin to the well. It bore many messages. The well used to be one source of income. The residents used water to vegetation as well as their own purpose. But things are different now. The well is becoming an antique item in the urbanity. A well could be dug in the garden to keep up with the tradition. For some, this may be a joke. For some, this may be a good symbolic gesture to keep up with the tradition. For some, this may just be ridiculous. To dig the well or not, that is not the question. The question is if we should accept and come to terms with evolution. With evolution, customs have to change. This metamorphosis has quite a few words: globalisation, modernization and urbanisation are beautiful words. We had no other source of water. So we had to keep well in reverence. The well was an important element, hence it had related customs. Now with the pipelines flowing down beneath us, do we still have to adhere to that particular custom? It doesn’t mean we must cease respecting the ancient water systems. But we too have to move on. This is one example. When these customs cease, the questions and criticism emerge. The New Year is losing its glamour, some can easily opine. These opinions matter, and are relevant. The festivities may lose their glamour. But who can expect glamour to continue every year without any difference? Seasons change. New discoveries unfold. If these come to pass, how can only the festivities remain undisturbed? The New Year has truly become the trader’ festival, one may say, as they are the category most benefited by the occasion. Saying so doesn’t mean we must reverse the situation. We simply cannot do that. We cannot reverse the grown-up human necessities. Our era is technologically advanced. But that does not matter. Many doubts have started surfacing. This is merely one period we are passing. Many more things have occurred, and are about to occur. With many arguments and questions drifting through, what is left for us is to keep up with the tradition that evolves with time. As we roam among a techno-savvy crowd, the real Avurudu is gradually becoming a vintage festival. Ergo, in a century’s time, this very same Avurudu might not be able to retain the civil eminence it is privileged with now. It will be left inscribed in the vulnerable sands of history as a good old antique festival. Despite all changes – come what may – what is around the corner is a period for renewed hope. Let the shattered and resentful connections be restored to freshness and vigor.